Mowing the grass can be a chore for many people, and having mower problems can cause this job to become frustrating at times. One type of frustration would be when the mower keeps stalling. Motor stalls have various signs in advance of the stall. Several things can cause stalling. Most stalling-related problems can be solved using the process of elimination to find the actual cause. Be vigilant for various signs that the mower is about to stall. Sudden increases in motor speed or noise can signal abrupt stalling. Sputtering or sudden misfiring of the motor are signals that the mower is about to stall. Sudden smoke or emissions from the motor or carborator can signal an oncoming stall. Several fuel-related issues can cause a mower to continuously stall. Bad fuel, burnt fuel or very old fuel can cause improper firing of the motor which causes the motor to stall out. Water in the fuel or motor will cause the mower to stall until the water is evaporated or drained. Air bubbles in the fuel line can cause stalling; this is a result of cracks in the fuel line or carburetor allowing excess airflow into the engine. Wrong fuel mixtures can cause stalling and possible engine damage; incorrectly using 2-cycle fuel or a fuel/oil mixture will usually be the cause of this problem. Mechanical problems can cause continuous stalling. Incorrect setting of the throttle, choke or governor causes either the fuel or air flow to be incorrect, resulting in the motor stalling. Settings can be affected by loose or broken springs, hinges, levers or wiring. Mechanical problems can also cause fuel to burn faster which in turn can stall the motor. Improper cleaning of the mower can cause debris or grass buildup around the motor or blades. This blockage causes excess pressure on the motor that can lead to stalling to relieve motor stress. Lack of airflow into the carburetor or engine also causes stalling. 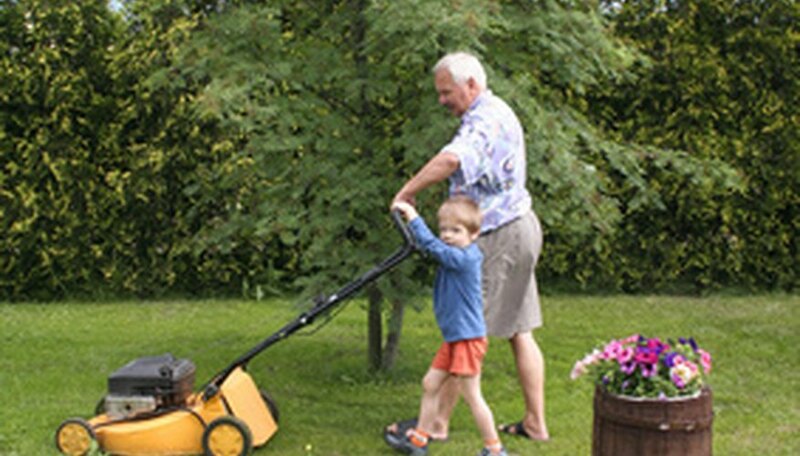 Mowing high grass or thick brush can cause undue stress on the motor and result in stalling. Wet grass can stick to the motor or blades, decreasing airflow and increasing stress on the motor. Scheduled maintenance as well as cleaning after each use helps prevent mower stalls. Mowing grass at the proper height in dry conditions helps reduce mower stress and the potential to stall. Having a seperate container for lawn mower fuel will eliminate many fuel-related stalling issues. Proper winterization, including draining of all fluids, ensures that fresh fuel and oil will be used each season.